Download "Ford Motor Company of Canada, Limited. Ontario Statement of Commitment, Accessibility Policy and Accessibility Plan"
1 Ford Motor Company of Canada, Limited Ontario Statement of Commitment, Accessibility Policy and Accessibility Plan Statement of Commitment The Accessibility for Ontarians with Disabilities Act (the Act ) and the Accessibility Standards for Customer Service and Integrated Accessibility Standards Regulation (the Regulations ) are designed to prevent and remove barriers to accessibility in the Province of Ontario and to respect the dignity and independence of persons with disabilities. 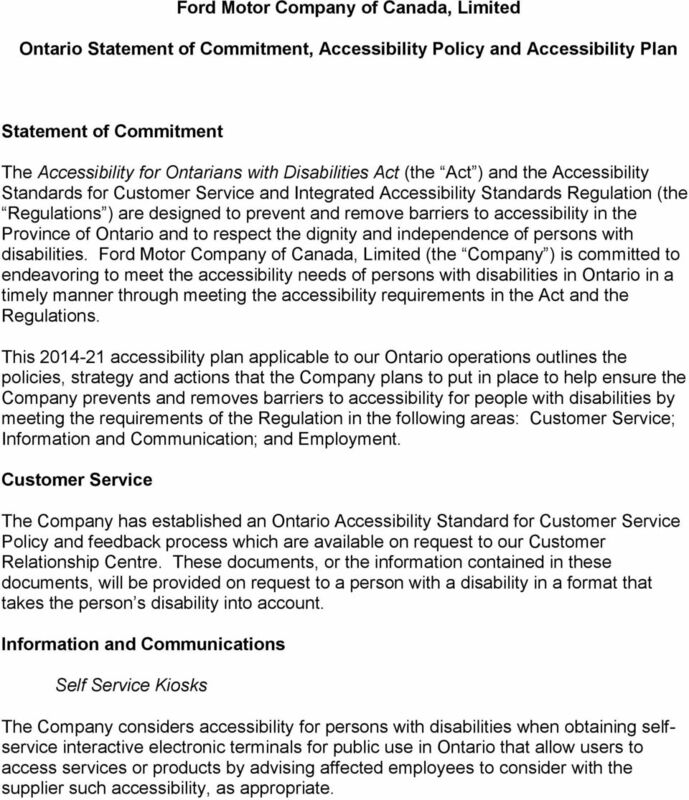 Ford Motor Company of Canada, Limited (the Company ) is committed to endeavoring to meet the accessibility needs of persons with disabilities in Ontario in a timely manner through meeting the accessibility requirements in the Act and the Regulations. 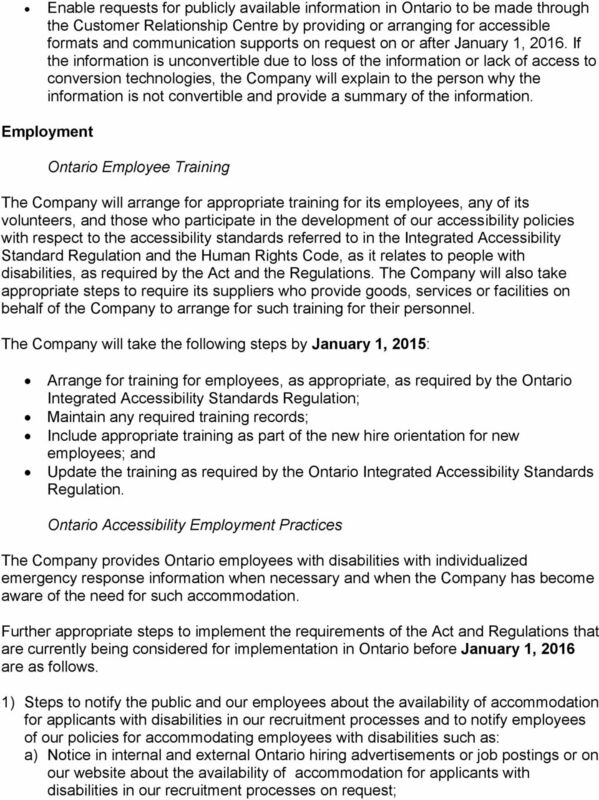 This accessibility plan applicable to our Ontario operations outlines the policies, strategy and actions that the Company plans to put in place to help ensure the Company prevents and removes barriers to accessibility for people with disabilities by meeting the requirements of the Regulation in the following areas: Customer Service; Information and Communication; and Employment. 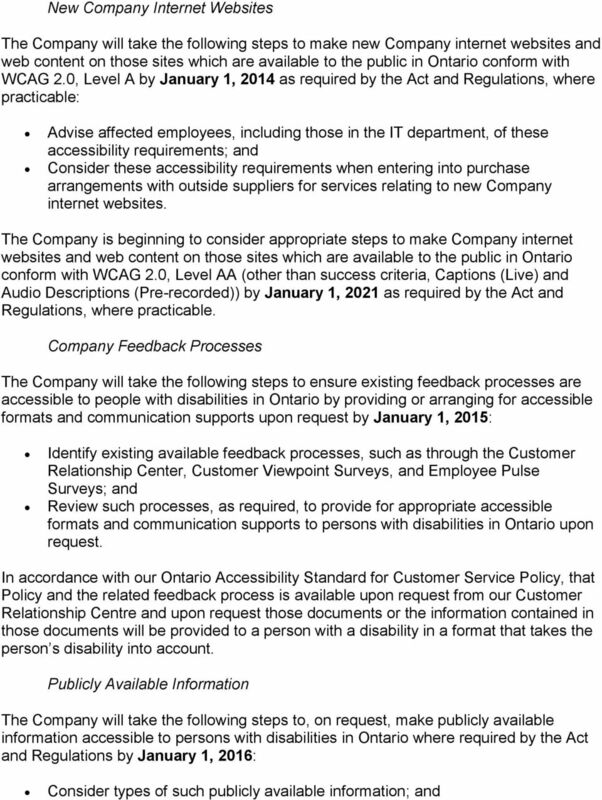 Customer Service The Company has established an Ontario Accessibility Standard for Customer Service Policy and feedback process which are available on request to our Customer Relationship Centre. These documents, or the information contained in these documents, will be provided on request to a person with a disability in a format that takes the person s disability into account. Information and Communications Self Service Kiosks The Company considers accessibility for persons with disabilities when obtaining selfservice interactive electronic terminals for public use in Ontario that allow users to access services or products by advising affected employees to consider with the supplier such accessibility, as appropriate. 4 b) Notice when applicants are selected to participate in an assessment or selection process that accommodations are available upon request in relation to the materials or processes to be used; c) Notice in Ontario offers of employment of our policies for accommodating employees with disabilities; d) Ontario facility posting and/or an informing Ontario employees of the policies used to support employees with disabilities, including policies on the provision of job accommodations and inclusion of this information in new hire orientation; e) In consultation with the employee where an Ontario employee with a disability requests, provision of accessible formats and communication supports for information needed for the employee to perform the job and that is generally available to employees in the workplace; and f) Updated information to be provided where required through the same mechanisms. 2) Steps to develop and put in place a written process for developing documented individual accommodation plans for Ontario employees with disabilities and a documented return to work process for Ontario employees who have been absent from work due to a disability and require disability related accommodations in order to return to work such as: a) The Company will work with employees with disabilities to develop individual accommodation plans that take into account their accessibility needs, as appropriate; b) The Company will arrange for the Company Physician to consult with an employee s physician when developing the employee s individual accommodation plan, as applicable; and c) The Company will work with its benefit service provider to develop a process to facilitate the return to work of employees who were absent because their disability required them to be away from work. 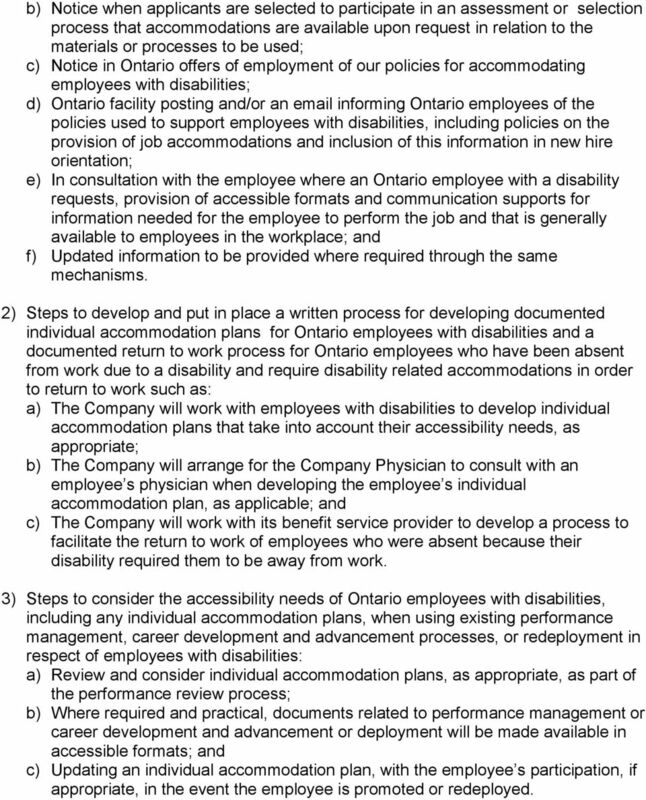 3) Steps to consider the accessibility needs of Ontario employees with disabilities, including any individual accommodation plans, when using existing performance management, career development and advancement processes, or redeployment in respect of employees with disabilities: a) Review and consider individual accommodation plans, as appropriate, as part of the performance review process; b) Where required and practical, documents related to performance management or career development and advancement or deployment will be made available in accessible formats; and c) Updating an individual accommodation plan, with the employee s participation, if appropriate, in the event the employee is promoted or redeployed. 5 For more information For more information regarding this Ontario Statement of Commitment, Accessibility Policy and Accessibility Plan, please contact: Ford Motor Company of Canada, Limited The Canadian Road P.O. Box 2000 Oakville, Ontario, Canada L6K 0C FORD (3673) or us at Contact Us on Accessible formats of this document are available for free upon request. Why should we hire a female apprentice?